Introduction: Colles' fractures are one of the most common adult fractures encountered during clinical practice of an orthopaedic surgeon. It occur as the result of a fall on the outstretched hand (FOOSH). They consist of a fracture of distal redial metaphyseal region with dorsal angulation and impaction but without the involvement of the articular surface. Material and Methods: Twenty eight patients with severely displaced Colles' fractures were treated with closed reduction and percutaneous pinning with two/three kirschner wires. All the fractures healed within 3 months.Anatomical result was excellent or good in 22(80%) cases, but 6(20%) cases developed malunion. Functional results were satisfactory in all the cases. At a mean follow up of 3 years after injury, none had wrist pain. Grip strength was 95% of the opposite normal side. There were no serious complications. No patient had a significant loss of rotation of the forearm. Conclusion: The study showed that additional fixation improves both the anatomical and functional results after a Colles' fracture.Our results showed that the procedure ia a very effective treatment option for severely displaced Colles' fractures. Colles' fractures are the most common extra-articular fractures of the distal radius that occur as the result of a fall onto an outstretched hand (FOOSH). They consist of a fracture of the distal radial metaphyseal region with dorsal angulation and impaction, but without the involvement of the articular surface. They are particularly common in patients with osteoporosis, and as such, they are most frequently seen in elderly women. Younger patients who sustain Colles' fractures have usually been involved in high-impact trauma or have fallen, e.g., during contact sports, skiing, and horse riding. Severely displaced Colles' fracture remains challenging problems of the orthopedic surgeons as they tend to heal with malunion. Dorsal angulation can disturb radiocarpal function and reduce the range of motion. Decreased radial inclination or radial shortening may result in poor grip strength. Most authors agree that maintaining radial length is one of the most crucial factors in regaining function of the wrist and shortening >4–6 mm compromises function especially at the distal radioulnar joint. Between January 2013 and August 2017, we treated 28 severely displaced Colles' fractures by closed reduction and percutaneous two/three preferably three K-wires under C-arm image intensifier. 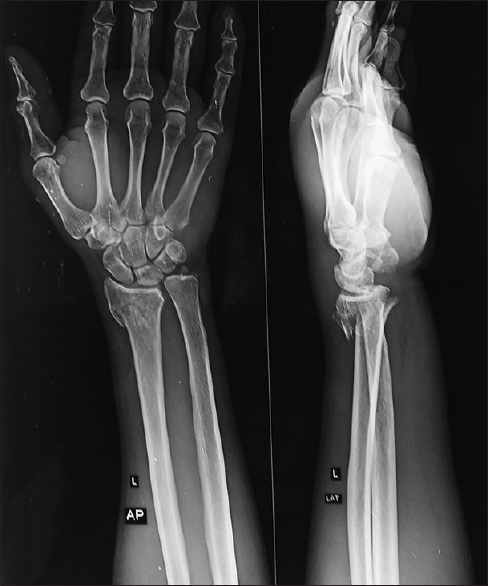 Eleven patients had associated ulnar styloid process fractures. Twenty-one patients were females and 7 patients were males with an average age of 50 years (35–70 years). The mean follow-up was 3 years (1–4 years). In 20 patients, the fracture involved the dominant hand. The mode of trauma was a simple FOOSH in 20 patients and a sports-related injury in seven patients. All were closed fractures. Fractures were classified according to the AO classification, using the preoperative anteroposterior and lateral roentgenogram [Figure 1]. All 28 patients had AO type A2 fractures. All the patients were subjected to radiographic examination of the affected and the normal side at the time of injury. The radial angle, dorsal angle, radial shortening, and shortening at the radioulnar joint were measured. The inclusion criteria were recent fractures (within 3 weeks post injury), adult patients (>35 years of age), and closed fractures (displaced and unstable). The exclusion criteria were patients with poor anesthetic risk, open fractures, displaced comminuted intra-articular fractures, bilateral fractures, polytrauma patients, previous fracture in the same limb, preexisting impairment of function of the same limb, lost for follow-up, and mental or physical inability to cooperate. Closed manipulative reduction of the fracture was achieved by longitudinal traction and direct pressure over the displaced fragment under axillary or general anesthesia. Reduction was maintained by traction with the help of two assistants. Hyperextension or flexion manoeuvers to disimpact the fragments were not recommended. The reduction was confirmed under image intensifier in both anteroposterior and lateral views [Figure 2] and [Figure 3]. We focused on the prevention of radial shortening more than radial deviation. 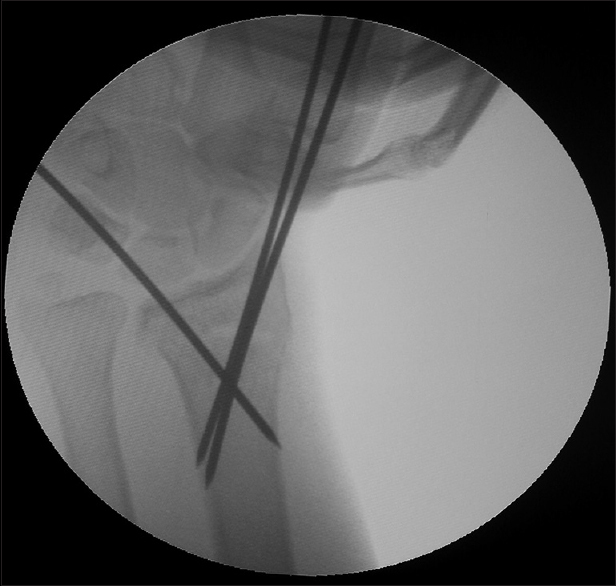 As an assistant held the wrist with a fracture in the reduced position, the first K-wire 1.5–2 mm was inserted from the dorsolateral aspect of the distal radius at the radial styloid between the first and second wrist extensor compartments at an angle 45° with a long axis of the radius and 10° dorsally. The wire was engaged into the ulnar cortex of the proximal radius. The second K-wire was introduced from the dorsomedial aspect of the distal fragment between the fourth and the fifth dorsal wrist extensor compartments, starting at the ulnar corner of the distal radius. It was directed 45° to the long axis of the radius and 30° palmer and was inserted into the radial cortex of the proximal radius. After checking the stability of the fracture under image intensifier, if required, a third K-wire was passed from the dorsolateral aspect of the radius from distal to proximal fragment. The wires were drilled to engage the opposite cortex. The quality of the reduction and fixation was again checked under the image intensifier. The K-wires were bent at a right angle and cut short outside the skin for easy removal. A sterile dressing including sponge padding was applied to prevent skin irritation. This was followed by dorsoradial below elbow plaster of Paris slab up to the knuckles. Postoperatively, the limb was kept elevated for 24 h. Radiographs were taken on the first or second postoperative day [Figure 4]. All the patients were instructed to do finger, elbow, and shoulder exercises regularly and frequently. Patients were discharged 24 h postsurgery after ensuring distal circulation of the fingers. Plaster slab was removed by the 5th week. The wires were removed on the 6th week without anesthesia depending on the radiological and clinical evidences of union [Figure 5]. Intensive regular exercises were instructed after the removal of the plaster. Handgrip was improved using softball exercises. Wrist physiotherapy and handgrip exercises were continued for another 2–4 weeks. We performed a clinical, radiological, and functional reviews at 6 weeks, 6 months, and 1 year, respectively. Excellent: No or insignificant deformity; dorsal angulation not exceeding 0°, shortening of <3 mm, or loss of radial deviation not >4°. Functional result was assessed by the criteria outlined by Gartland and Werley. There were 21 females and 7 males. The average age at the time of operation was 50 years (range 35–70 years). The average duration from injury to operation was 5 days (range 1–21 days). In 80% of injuries, the cause was FOOSH and sports-related injury, particularly fall from height in 20%. Twenty-two cases (80%) had an excellent or good anatomical result, but in 6 (20%) cases, the result was unsatisfactory [Table 1]. A good or excellent reduction had been obtained at the time of pinning, or the deformity had recurred before union in those six cases. The radiological measurements at different stages are shown in [Table 2]. The radial length had improved in all but three patients compared with that prereduction length. The mean gain in length was 5 mm if measured at the styloid process and 2 mm if measured at the distal radioulnar joint. The average final shortening was 2 mm and 1 mm, respectively. The average dorsal angle was 2° and the mean radial angle was 19°. The worst shortening and the greatest loss of radial angle were present in the same six cases. All the patients had an excellent or good functional recovery [Table 1]. Of the six cases with malunion, three had an excellent and three a good functional score. Twenty patients (67%) scored zero points (excellent) and 4 (13%) patients scored 2 points (good) at subjective assessment. At follow-up examination, none complained of pain at wrist, and there were no signs of osteoarthrosis of the wrist. The average grip strength was 95% of the opposite normal side. Reflex sympathetic dystrophy (aligodystrophy) developed in 3 (10%) patients and pin-tract infection was observed in 4 (15%) cases which was controlled with short-term antibiotics. One patient had a mild carpal tunnel syndrome which did not require an operation. In four cases, we found proximal migration of pins which caused no problem in removal. Most authors believe that there is a firm relationship between the quality of reduction and the restoration of function. The appearance of malunion also deserves consideration. Malunion with dorsal angulation of <10° or radial deviation of <10° does not cause any loss of function. However, gross angulation leads to limitation of movements and cosmetic deformity. Functional results were good or excellent in all in spite of the presence of malunion in six cases. The primary objective of the treatment is to maintain the best anatomical result. Shortening of the radius is correlated with poor function. We gave more importance to the prevention of radial shortening than to the reduction of dorsal and radial displacement. Eighty percent good and excellent anatomical results were reported in 22 cases of unstable fractures of the distal radius treated by intrafocal pinning. Good or excellent functional result in unstable Colle's fractures with pinning and external fixation has also been reported., Immediate mobilization should be started only in patients with good bone stock. External fixators can maintain radial length and radial inclination by ligamentotaxis but cannot effectively maintain palmer tilt. Also, complications such as pin loosening, pin-tract infection, reflex sympathetic dystrophy, radial sensory neuritis, and delayed union are as high as 60% with the use of external fixators. Thus, external fixators are better avoided in noncomminuted extra-articular distal radial fractures. Reflex sympathetic dystrophy (aligodystrophy) is probably the most common and the most underestimated complication of the wrist functions. Other complications such as pin-tract infection probably had little effect. The anatomical result was not as good as we had expected, but the overall result was satisfactory. Even after open reduction and internal fixation, comminuted distal radius fractures have a large number of complications such as stiffness, pain, and reduced grip strength. In conclusion, clearly unstable Colles' fracture should be treated aggressively with percutaneous pinning and immobilization of the fracture with wrist immobilized at a neutral position and early physiotherapy. It is a safe, simple, and effective technique. Percutaneous fixation avoids the problems of internal fixation and with minimal invasive surgery. The congruity of the radiocarpal joint is maintained, and the reduction is stabilized. Complications are few, and almost anatomical alignment is possible. Although multiple modalities of treatment have been advocated, percutaneous fixation of the displaced distal radius fractures has usually been credited with the best restoration of anatomy as well as function. Cherubino P, Bini A, Marcolli D. Management of distal radius fractures: Treatment protocol and functional results. Injury 2010;41:1120-6. Viller RN, Marsh D, Rusthon N, Greatorex RA. Three years after Colles' fracture productive review. J Bone Joint Surg 1987;69-B: 635-8. Rayhack JM. 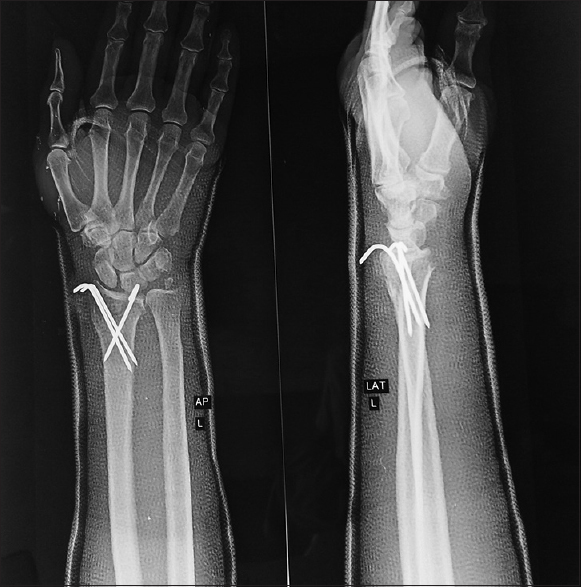 The history and evolution of percutaneous pinning of displaced distal radius fractures. Orthop Clin North Am 1993;24:287-300. Green DP. Pins and plaster treatment of comminuted fractures of the distal end of the radius. J Bone Joint Surg Am 1975;57:304-10. Jenkins NH, Jones DG, Johnson SR, Mintowt-Czyz WJ. External fixation of Colles' fracture an anatomical study. J Bone Joint Surg 1989;71-B:68-73. Kapandji A. Internal fixation by double intrafocal plate. Functional treatment of non articular fractures of the lower end of the radius (author's transl). Ann Chir 1976;30:903-8. Rayhack JM, Langworthy JN, Belsole RJ. 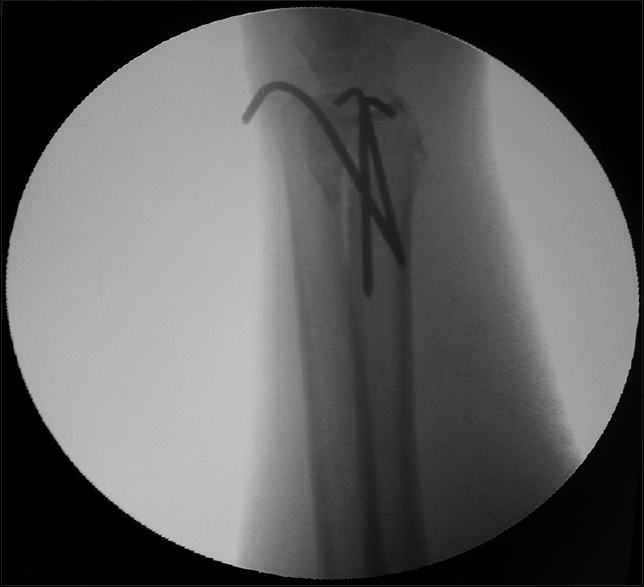 Transulnar percutaneous pinning of displaced distal radial fractures: A preliminary report. J Orthop Trauma 1989;3:107-14. Edwards GS Jr. Intra-articular fractures of the distal part of the radius treated with the small AO external fixator. J Bone Joint Surg Am 1991;73:1241-50. Nagi ON, DhillonMS, Aggarwal S, Deogaonkar KJ. External fixators for intra-articular distal radius fractures. Indian J Orthop 2004;38:19-22. Ruch DS, Ginn TA. Open reduction and internal fixation of distal radius fractures. Oper Tech Orthop 2000;13:138-43. Doi K, Hattori Y, Otsuka K, Abe Y, Yamamoto H. Intra-articular fractures of the distal aspect of the radius: Arthroscopically assisted reduction compared with open reduction and internal fixation. J Bone Joint Surg Am 1999;81:1093-110. Clancey GJ. Percutaneous Kirschner-wire fixation of Colles fractures. A prospective study of thirty cases. J Bone Joint Surg Am 1984;66:1008-14. Nonnenmacher J, Kempf I. Role of intrafocal pinning in the treatment of wrist fractures. Int Orthop 1988;12:155-62. Gartland JJ Jr., Werley CW. Evaluation of healed Colles' fractures. J Bone Joint Surg Am 1951;33-A:895-907. Scheck M. Long-term follow-up of treatment of comminuted fractures of the distal end of the radius by transfixation with Kirschner wires and cast. J Bone Joint Surg Am 1962;44-A:337-51. Jupiter JB. Fractures of the distal end of the radius. J Bone Joint Surg Am 1991;73:461-9. Greatting MD, Bishop AT. Intrafocal (Kapandji) pinning of unstable fractures of the distal radius. Orthop Clin North Am 1993;24:301-7. Cannegieter DM, Juttmann JW. Cancellous grafting and external fixation for unstable Colles' fractures. J Bone Joint Surg Br 1997;79:428-32. Chan BK, Leong LC, Low CO, See HF. The use of the external fixator in the treatment of intra-articular fractures of the distal radius. Singapore Med J 1999;40:420-4. Sanders RA, Keppel FL, Waldrop JI. 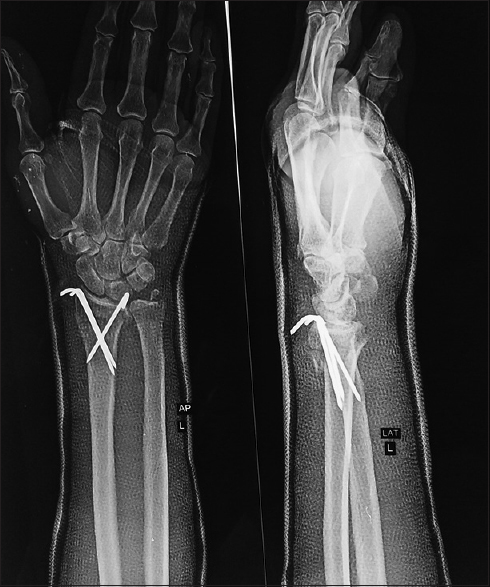 External fixation of distal radial fractures: Results and complications. J Hand Surg Am 1991;16:385-91. Atkins RM, Duckworth T, Kanis JA. Features of algodystrophy after Colles' fracture. J Bone Joint Surg Br 1990;72:105-10.